HomeFor ClientsAnalyticsForex Analysis & ForecastsForex Technical analysis and forecastsForex Technical Analysis 2011/03/29 (EUR/USD, GBP/USD, USD/CHF, NZD/USD, AUD/USD) Forecast FX. 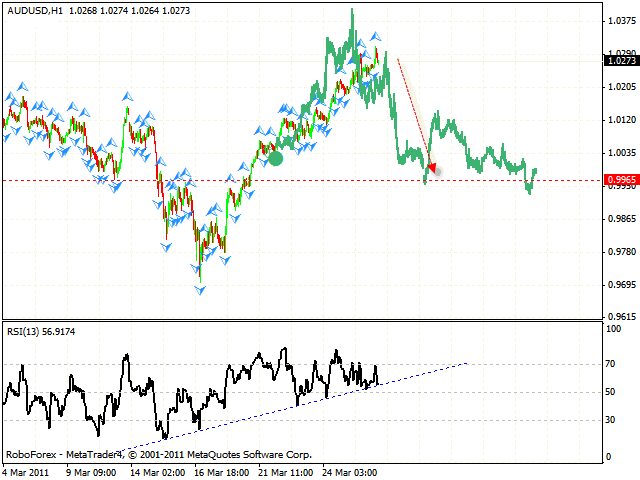 Forex Technical Analysis 2011/03/29 (EUR/USD, GBP/USD, USD/CHF, NZD/USD, AUD/USD) Forecast FX. The EUR/USD currency pair has reached the first target defined earlier, and at the moment we have descending structure forming with the target in the area of 1.3991. 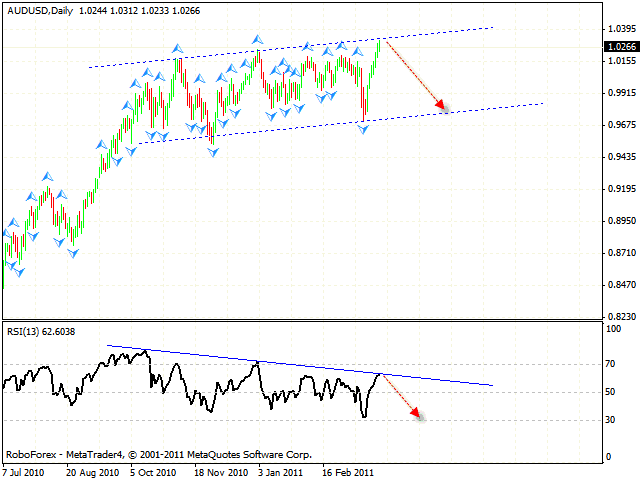 One can try to sell the pair with the stop above 1.4080. However, if the price breaks the descending channel, we will recommend you not to sell the pair. 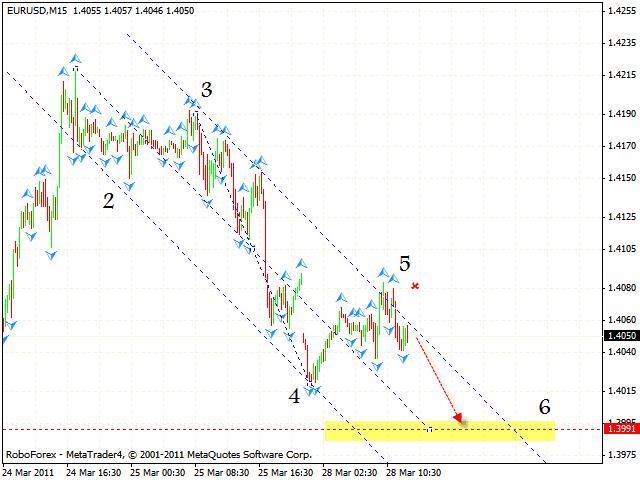 Pound is also moving inside the descending channel, the target of the fall is the area of 1.5860. One can consider selling Pound with the tight stop near the level of 1.6005. But if the price breaks the channel’s upper border, one will be recommended to close short positions. 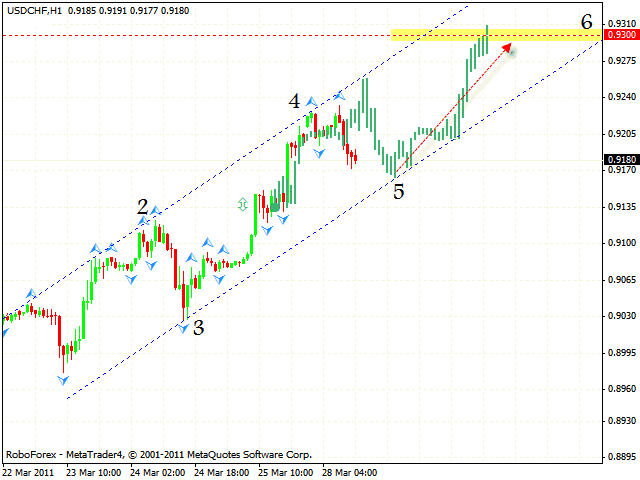 In case of Franc we can see the formation of the rising symmetrical structure with the target in the area of 0.9300. 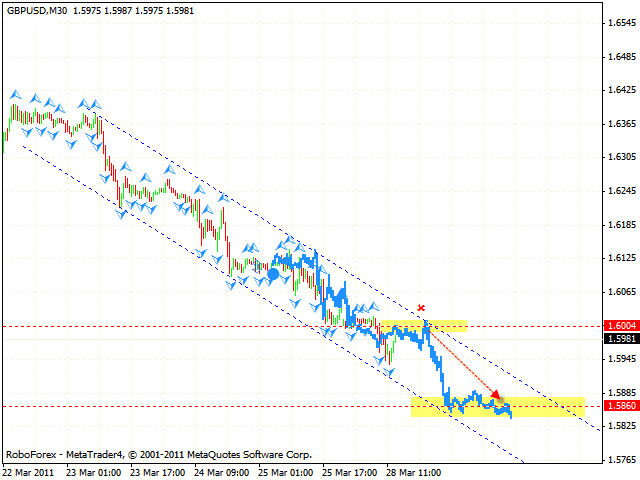 One can consider buying the pair form the channel’s lower border in the area of 0.9165. The stop must be below 0.9135. 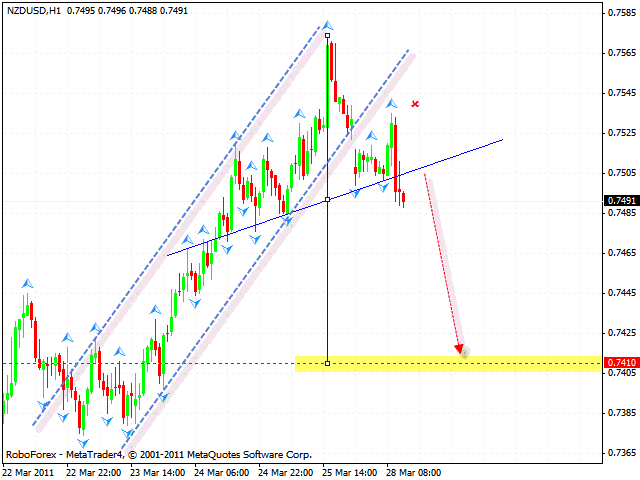 However, if the price leaves the channel, this case scenario will be cancelled. Judging by analysis of the daily chart of the NZD/USD currency pair, we should expect the price to start moving downwards with the target in the area of 0.6965. The price testing the trend’s descending line at the RSI is an additional signal to sell the pair. The target of the fall is the channel’s lower border. At the daily chart of the pair we have “head & shoulders” reversal pattern forming with the target in the area of 0.7410. The stop must be above 0.7540. In case of Australian Dollar the situation is quite similar. The price is testing the channel’s upper border, the RSI is testing the trend’s descending line, and we should expect the price to fall. The target of the fall is the area of 0.9700. At the hourly chart we can see that the rising pattern has been completely formed, we should expect the pair to fall from the current levels. 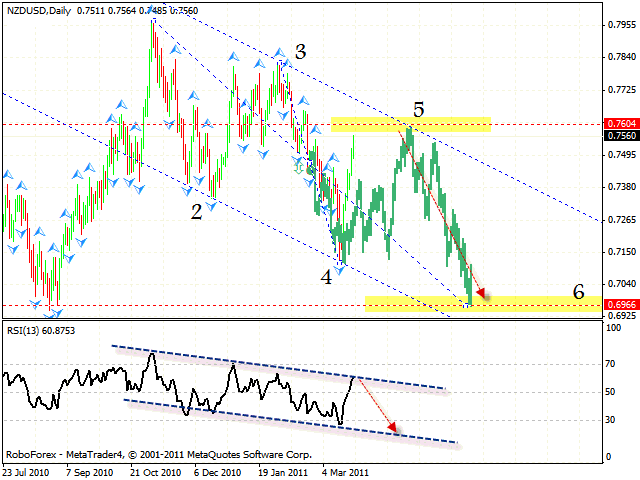 One can consider selling the pair after the price breaks the trend’s rising line at the RSI. The closest target of the fall is the area of 0.9965.